You are here: Home / The Spin / What Makes You Happy? Together with the OneStory App and Ahimsa Media, Realwheels has been collecting short video interviews about what makes individual people happy. We ran a campaign designed to show how we all define and articulate our identity, and to explore ideas that are universal amongst all people, regardless of physicality. You can view the videos on the OneStory site or on your iPhone or iPad. We are really looking forward to seeing this collection of happiness grow. At Realwheels, we’ve already been inspired by what we’ve heard. 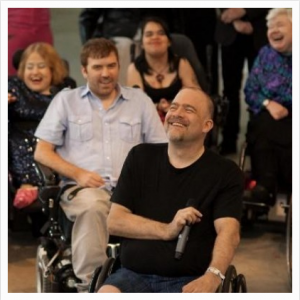 Add your voice and share your story using #WheelVoices on any of your social feeds. Filed Under: The Spin, What Grinds Our Gears, Wheely Good Tagged With: #WheelVoices, Ahimsa Media, collection of happiness, defining your identity, happiness campaign, happiness is universal, OneStory, OneStory App, Realwheels, video interviews, What Makes You Happy?